Have you ever wanted to share your laptop Wi-Fi with other devices and wonder how you can do it? Well, there are different ways you can turn your laptop into a hotspot. For example, you can go the tech route and configure your Windows operating system (works for Windows 7 and over) to enable Internet sharing from your laptop to other devices. However, this method usually doesn’t work for most people due to various reasons. The most common one is registry corruption. If you have been installing and uninstalling various software programs in your laptop, chances are that some of them have modified the registry and hence creating a hotspot through Windows inbuilt driver will be impossible. The good news is you can easily turn your laptop into a hotspot using easy-to-use software called Connectify Me. Read on this Connectify review. Connectify Review: What is Connectify Me? Connectify Me is a small software that when installed, automatically turns your laptop into a hotspot. This means you can share your laptop Internet with multiple devices such as smartphones, tablets and other laptops. Connectify Hotspot acts as a wireless router between any Internet connection you are using, and enables it to be shared with other devices. You may be wondering why you would need to connect multiple devices to a single Internet connection. Well, there are in fact a number of benefits of doing so. For example, you won’t need to subscribe to different Internet data packages for the various devices you have. For example, if you live in a family of three, everyone can connect to the same Internet connection regardless of the device they are using. This means there is no need to purchase multiple data packages. Here are some of the benefits of using Connectify Hotspot. Connectify Me acts like a virtual router that allows you to share your laptop Internet connection to various devices. For example, you can share the Interne connection with other laptops, your e-reader, media player, tablet or smartphone. If you wish, you can also allow your friends or co-workers to connect to your connections. To do this, simply give them the password they will need to connect. If you travel a lot and use hotels, you may be aware of the Internet-per-device charges. Basically, hotels that provide Internet charge customers for every device that is connected to the Internet. Most of us need multiple connections, for example one for the laptop and one for the smartphone. With Connectify Me, you will not need to pay for multiple devices. Simply ask for your laptop to be connected and then turn it into hotspot using Connectify Me to be able to use multiple devices. This means you will get Internet on all your devices while only paying for the price of one. If you are using a tethered plan, 3G or 4G USB adapter for your mobile phone, you can share the Internet connection to keep all your devices online wherever you are. This feature is available in Connectify Pro & Max. With Connectify MAX, you can extend the range of your existing Wi-Fi network. 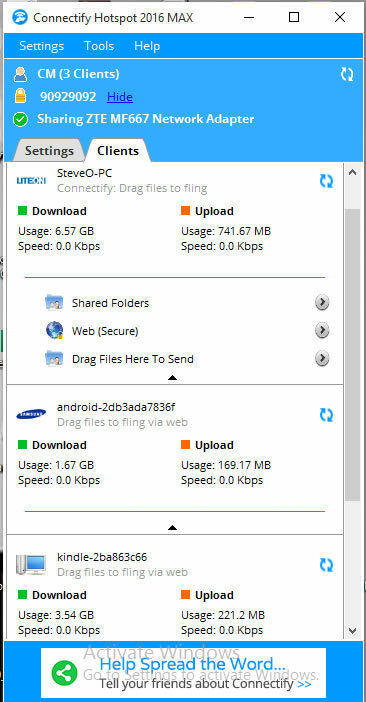 You can use Hotspot MAX for windows to enjoy maximum connectivity across different devices, including streaming media and game consoles. The applications connected to your laptop hotspot will work as if they are connected to the original network. This feature is available in Connectify Hotspot MAX. Connectify Hotspot MAX also allows you to bridge your network so that game consoles and other devices connected to the laptop network appear to be on the source network. You can use Hotspot MAX Bridging Mode to ensure your Xbox 3, PS3 and other consoles work instantly on your home network. The Bridging Mode feature ensures there are no freezes when playing your game consoles online. There are three versions of Connectify Hotspot you can try. First, there is the free, lite version and then there is the paid, Pro version and finally, there is the Max Version. Connectify Lite automatically generates a password for your Wi-Fi connection. However, the ability to change the password is available in Pro and MAX versions. The upload and download speeds of the devices. Check the image below to get an idea of the information available for devices connected to your network. This comes in handy if your data is bound to be cut off after a specific amount of usage. These are the paid version of Connectify Hotspot. The price for the Pro version is $35 while that of the MAX version is $50. You can either buy any of the licenses for a yearly or lifetime license. UPDATE: June 2016. Connectify is offering 75% off on all its licenses. Click here to take advantage of the deal before it’s too late. I suggest you go for the lifetime license, which will only cost you $15and you will get 3 lifetime license. Get the DEAL. The Connectify Me PRO and MAX versions allow you to name your hotspot any name you would like. With the free version, the hotspot is chosen by default to Connectify-me and cannot be changed. If you have a tethering plan on your mobile device or PC, you can easily connect through it through Connectify Pro and MAX. If you want to control the custom IP and DHCP configurations for every device that connects to the Internet through your laptop, you should get the Connectify MAX version. This feature is useful for custom applications, Peer 2 Peer sharing and gaming. This feature is only available in the MAX version. When Bridging is enabled, you can connect your devices to the actual network rather than through the laptop. This feature is great if you usually play online games. The Repeater mode extends the range of your Wi-Fi. With the lite (free) Connectify version, you can only “fling” (i.e. transfer) a few files between connected devices. However, Pro and MAX versions allow you to send unlimited files directly to connected devices, even when you don’t have an Internet connection. If you have multiple devices that you usually need connected to the Internet, I highly recommend you get Connectify Me Pro. The software will save you a ton of money on data charges and frustrations of trying to get your Windows PC to share Internet connection. You can purchase Connectify-Me on the official website here. Take advantage of the 75% off deal to save massively. I hope you have enjoyed this Connectify review. If you would like a review on any software or application, let me know through the contact page.